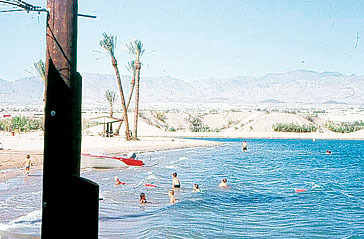 Lake Havasu Beach in 1969. At the fourth meeting of the State Parks Board held in Yuma on August 12, 1957, Alvin O. Hurst, of the National Parks Service and serving as Chief of the Lower Colorado River Survey, made a presentation to the Parks Board. It showed the potential for recreation development along the Colorado River for 250 miles from Yuma (the Mexican Border) to Davis Dam north of Bullhead City. The Parks Board was quite impressed with the presentation and stated that the Board should be considered as a future partner in the development of recreational facilities for some of the sites, which were to be held for those purposes. The Board felt it was too early in its existence to make a definite commitment that day. However, the Board requested the Director to continue to work with Mr. Hurst as some of the sites along the Colorado River would make excellent state parks in the future. The Parks Board authorized staff to make an evaluation of the Lower Colorado River and its adjoining land from Bullhead City to the Mexican border for potential State Parks in early 1961. Those areas considered being of State Park caliber and statewide significance were identified and established as study areas by a Parks Board action taken in December 1961. Following that action, there was a continuous and intensive evaluation and study made in conjunction with the U.S. Department of the Interior’s Lower Colorado River Land Use Office planning staff and through a series of workshops involving Arizona agencies. By April 1962, the Parks staff proposed the areas meeting the criteria for State Parks be adopted by the Parks Board with a flexible priority program relative to leasing, planning, development, and operation. The Parks Board adopted this program with the understanding it was subject to legislative and budgetary authorization. Lake Havasu campground concession in 1969. The State Parks’ study referred to as a “prospectus” was reviewed and evaluated by the Advisory Committee of the Lower Colorado River Land Use Plan and the Lower Colorado Land Use Office. The areas that became Buckskin Mountain State Park, Lake Havasu State Park, and Cattail Cove State Park were included in the final general program as areas to be administered by State Parks. The Lower Colorado Land Use Plan was approved by the Advisory Committee and submitted to the Secretary of Interior, Stewart Udall (from Arizona), for his consideration and approval in March of 1963. The Plan included the recommendation from the Advisory Committee that the main body of Lake Havasu and the adjacent land areas be administered by Arizona State Parks. The Secretary of Interior approved the Lower Colorado Land Use Plan on January 13, 1964. The U.S. Department of the Interior, Bureau of Reclamation leased the lands contained within Lake Havasu State Park and Cattail Cove State Park to the State Land Department on January 14, 1965. Through Contract Number 14-06-300-1533, the State of Arizona leased 13,072.36 acres of land for 50 years (See Appendix 1). The State Land Department then subleased the properties to State Parks on February 1, 1965 for park and recreation purposes. Also included in the lease document was the cancellation of the concession contract with McCulloch Properties Incorporated (MPI). A new concession contract on 1200 acres, mostly on Pittsburg Point, was completed between MPI and the State of Arizona for the 50-year term of the lease. 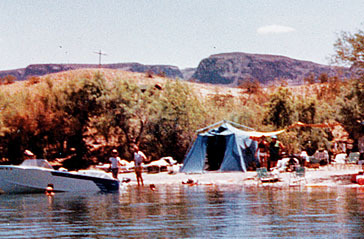 Boat access only campsite in 1969. 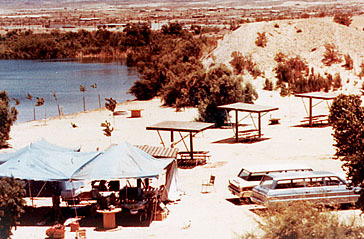 In 1965, the concession lease area contained the Lake Havasu Travel Trailer Park and the Cove Campground, later renamed Crazyhorse Campground. During the following three years MPI added Lake Havasu Airport, Nautical Inn, State Beach, and Lake Havasu Marina. The Park’s headquarters was located on the concession area, and the first Park Manager was Woodrow Seney. The staff concentrated on developing and servicing boat-in campsites along the Park shoreline, protecting the resources and removing dead, submerged cottonwood trees from beneath the lake waters that constituted a serious navigational hazard for recreational boaters. The staff was responsible for overseeing construction on the concession lands to ensure approved plans were followed. During this period, initial development began at Cattail Cove with Glen Cross becoming its first Park Manager. Between 1969 and 1971, the reconstruction of the London Bridge and the digging of the London Bridge Channel greatly changed the nature of the concession lands, and Pittsburg Point became an island. The London Bridge was acquired by MPI, taken apart in numbered pieces, and shipped to Lake Havasu City. With this historic attraction now in Lake Havasu City, the number of visitors to the area and the Park began to increase dramatically. Another factor that helped greatly with the increase in recreational visitors was the completion of Highway 95 between Parker and Lake Havasu City. Within the Park, two units were formed; Cattail Cove was already developed and open to visitors, and Windsor Beach was being planned for camping and day use developments. During the 1970’s, major recreation improvements were made at Windsor Beach, a concession operation was added at Cattail Cove and improvements were made to the more than 250 boat-in campsites along the shoreline. The improvements to the boat camps included shade ramadas, picnic tables, and fire grills for the individual sites. New restroom facilities were provided in close proximity of the boat camps. A headquarters building was constructed at the location of the original office on Pittsburg Point. The State Lake Improvement Fund (SLIF) and the Land and Water Conservation matched by State Funds provided the monies for improvements in the 1970’s and 1980’s. 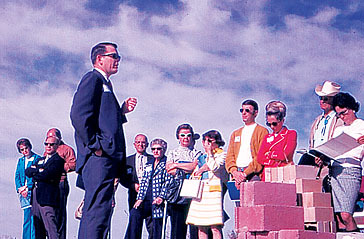 Site Six, the old McCulloch outboard motor test facility, was purchased in 1979 and renovated to create a First Aid and Safety Center for Lake Havasu. Campground and boat ramp improvements were made at both Cattail Cove and Windsor Beach. In 1986, a land exchange between the Federal Government and the Arizona State Land Department resulted in a boundary change for the Park. This land exchange was desired because the Bureau of Reclamation had taken State Trust lands across central Arizona for construction of the Central Arizona Project (CAP). The land takings were in excess of 30,000 acres with a value of $110 million. The Federal Government was required to compensate the State Trust with federal land of comparable value. The most valuable federal land in the State was Pittsburgh Point at Lake Havasu City. These lands were used to offset the major part of the Federal Government’s land debt to the State. The State Parks Board agreed to revise the Park boundaries to make the lands available for transfer to the State Land Department. Pittsburg Point, with its concession operations, was transferred to the State Land Department along with the northern section of the Windsor Beach Unit and the land west of Highway 95 from Mudshark Beach to Contact Point. Lake Havasu City received a land patent for Rotary Beach, 4 acres of Windsor Beach for a police station, and the Site-Six building and property. State Parks received a land patent for the remaining 331 acres of the Windsor Beach Unit and a patent for 286 acres of land along Oak Creek (Red Rock State Park) southwest of Sedona. The exchange reduced the Lake Havasu State Park acreage to 10,866 acres. Shortly after the 1986 land exchange, the Park was divided into two separate units for administrative and operational reasons. The Upper Lake Unit was responsible for the Park area from Standard Wash north to Contact Point and Windsor Beach. The Lower Lake Unit that operated out of Cattail Cove was responsible for the Park area from Standard Wash south to one mile past the Larned Landing area. In January 1987, the Lower Lake Unit became a separate Park known as Cattail Cove State Park and is located 15 miles south of Lake Havasu City off AZ 95. The Lake Havasu State Park headquarters moved into the new Water Safety Center located at Contact Point in 1993. This multi-agency facility replaced the facilities at Site-Six and the old office located on Pittsburg Point. In 1995, the Park boundary changed again. The Parks Board relinquished its lease in return for patents and long-term leases on the lands it had developed along the shore of Lake Havasu. At Lake Havasu State Park, Contact Point Unit, the agency received a patent, deed and lease on 591.94 acres. At Cattail Cove State Park, the agency received patent and lease on 2374.70 acres. Since 1995, the agency has patented 5 acres and purchased 1.258 acres that have been added to Windsor Beach Unit. Thus, the total acreage of Lake Havasu State Park is 928.076 acres (See Appendix 1-A). Lake Havasu State Park provides water-oriented recreation opportunities for its visitors. The climate is ideal for year-round use. The mild winters bring large numbers of people from cooler parts of the country, while the hot summers draw a younger, boating-oriented crowd mainly from southern California and Arizona. Cattail Cove State Park provides the visitor with a base of operation for recreational access to Lake Havasu. Park visitors can hike, picnic, camp, swim, fish, water ski or boat on the lake. The Park is a favorite access point for utilizing the boat-in campsites along the shoreline.